PT Kimia Farma (Persero) Tbk – Kimia Farma is a major public-listed pharmaceutical company in Indonesia. 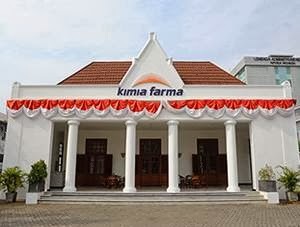 Kimia Farma is a state-owned company which is majority owned by the Government of Indonesia. Kimia Farma is listed on the Indonesia Stock Exchange (IDX) under reference code KAEF. As today, Kimia Farma is 90.025% owned by the Government of Indonesia which represented by the Minister of State-Owned Enterprises (SOE). Other 0.127% by management/employee and 9.848% by public. Kimia Farma has its business activities focused in pharmaceutical manufacturing, pharmaceutical trade and distribution, retail pharmacy, health clinic, laboratories and optical clinics. Headquartered in Jakarta, Kimia Farma now has 7 production plant; Plant Jakarta, Plant Bandung, Plant Semarang, Plant Watudakon, Plant Garam Farmasi, Plant Medan, and lant Rapid Test. Kimia Farma also supported by 1 research and development office at Bandung and 1 central logistic unit Jakarta. Kimia Farma also supported 6 directly-owned subsidiaries and affiliated companies, namely PT Kimia Farma Trading & Distribution, PT Kimia Farma Apotek, PT Sinkona Indonesia Lestari, PT Kimia Farma Diagnostik, PT Kimia Farma Sungwun Pharmacopia and PT Asuransi InHealth Indonesia. As of the end of September 2018, Kimia Farma has 1,135 pharmacies, 530 health clinics, 55 clinical laboratories, and 10 optics throughout Indonesia. According to information found in PT Kimia Farma (Persero) Tbk 2018 Third Quarter Report as quoted by JobsCDC.com, Kimia Farma is running well in the third quarter of 2018 (3Q18, ended in 30 September 2018). Kimia Farma registered total net revenue of Rp5.31 trillion (unaudited) as at the end of September 2018. This reflected an 23.37% increase year-on-year (YOY) as compared with Rp4.30 trillion (unaudited) in the same period previous year. Kimia Farma booked total profit of Rp483.29 billion in the third quarter of 2018 or 45.31% growth YOY as compared with Rp332.60 billion in the third quarter of 2017. Major : Pharmacy, S2 degree Pharmacy. Major : S1 degree any major. Major : S1 degree Architect, S2 degree Civil Engineering. Major : S1 degree Accounting. Major : S1 degree Information System, Information Management. Major : S1 degree Law. Major : S1 degree Civil Engineering. Major : S1 degree Architect, Information Systems. S1 degree in any related major.